These bulls are related to the same "Appanna" category who are worshipped by the devotees... and yet they go for slaughtering illegally. 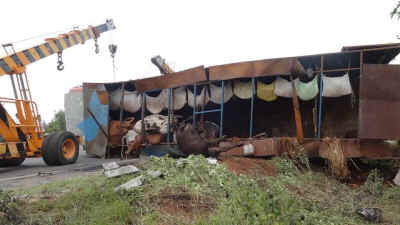 About 4 kms from the Visakha Society for Protection and Care of Animals (VSPCA) shelter, an enclosed truck with 27 precious Ongole bulls hit a bend in the road and toppled. Twenty of them died immediately. 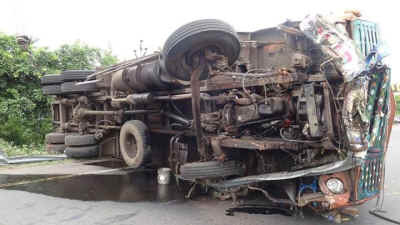 We were able to remove seven mangled bodies, provided first aid and brought them to our Shelter for further medical procedure. It was a whole day process as it was difficult to take the animals out and they were quite heavy too. The VSPCA team and the CRPI worked hard until late night. 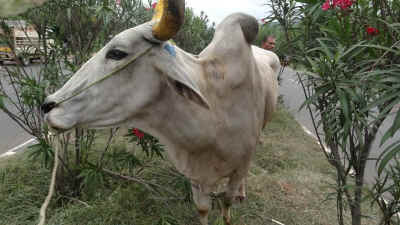 Previously we had rescued 36 of these same kinds of bulls from illegal transportation. We have registered a complaint with the Police Station. These bulls are not easy to handle and generally aggressive in nature. To make them docile the middlemen inject sedatives while transporting by walk or by vehicle. It will be hard to maintain them in our Shelter and they will be shifted to the Kindness Farm. We call upon your benevolence to support these majestic bulls who are in the endangered category and are priceless too.